Its almost Thanksgiving, the season of giving thanks. 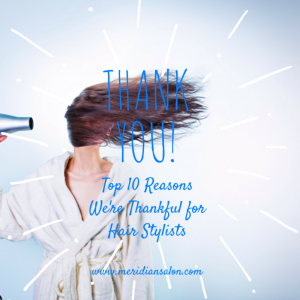 Today let’s thank our hair stylists. You know that feeling when you walk out of the salon feeling amazing? And you secretly wish to run into everyone you know so they can see how wonderful your look! 10. He or she gives you at-home hair secrets. Our hair stylists know we want to leave each day looking our best so they arm us with the secrets, tips and products to keep our salon look between appointments. 9. He or she gives you courage to try new things. Its easy to get in a hair rut. Your stylist knows you don’t want the same-old same-old. They know what styles and colors will flatter your face and complexion, and they’ll suggest ideas to modernize your look. 8. Two words: Scalp Massage. That time at the shampoo bowl is a little piece of heaven on earth. 7. He or she gives you samples. We love free stuff! And Bumble and bumble.’s new premium samples are even more fun with their replica mini-packaging. 6. He or she listens. Salon Chair Therapy is a thing. And rest assured, what happens in the chair, stays in the chair! 5. He or she knows this community. Restaurant recommendations? The best dentist in town? The inside scoop on the vacant-building next door? You want connections- your stylist has connections! 4. He or she knows the products that work for your hair. There is a big difference between hair that needs extra moisture and hair that needs a light and volumizing touch. Your stylist knows what you need. 3. He or she is highly skilled in more than hair and continues their education throughout their career. Many hair stylists offer services outside of hair styling such as make-up, nails, waxes and more. Throughout a hair stylist’s professional career, he or she will attend many classes, workshops and demonstrations to stay up to date on current trends, techniques and products. 2. He or she will fit you in for those special occasions. You’ve been looking forward to your anniversary cruise for months now, but did you forget to book your touch-up color? Chances are great your beloved stylist will fit you in to their jam-packed last-minute schedule! 1. He or she makes you look and feel beautiful! The truth is, getting the perfect blow out at home is not too likely. (Until we grow another pair of arms and the ability to see the back of our own head without a complex arrangement of bathroom mirrors) But your hair stylist teases beauty out of your hair with ease!